Whenever an engine is running, the lubrication oil collects metal particles from moving parts and pollutants such as dust, water, fuel or cooling liquid. Doing an ENGINE DIAGNOSTIC at regular intervals allows to analyse the behaviour of the mechanical parts and can prevent breakdown and malfunctions. IESPM has a special offer dedicated to the needs of individuals. The ENGINE DIAGNOSTIC can be done on all types of vehicles (car, motorcycle, boat, camper van, plane, etc. ), on all types of engines (Diesel, Petrol, biofuel, LPG, AVGAS, Kerosene, etc.) and on other components such as axles, gearboxes, stern tubes, etc..
What can an ENGINE DIAGNOSTIC reveal ? The oil carries informations on the state of your engine. Its analysis allows to highlight all the dysfunctions and to recommend you a maintenance adapted to your vehicle and to your use. – Viscosity measurement related to the grade of the oil (5W30, 15W40, etc.). It determines whether carbon particles are present, an overhigh operating temperature, shear of the lubricant, etc. This operation does not require particular mechanical knowledge, but some precautions are to be taken for a revealing analysis of the health of your engine. 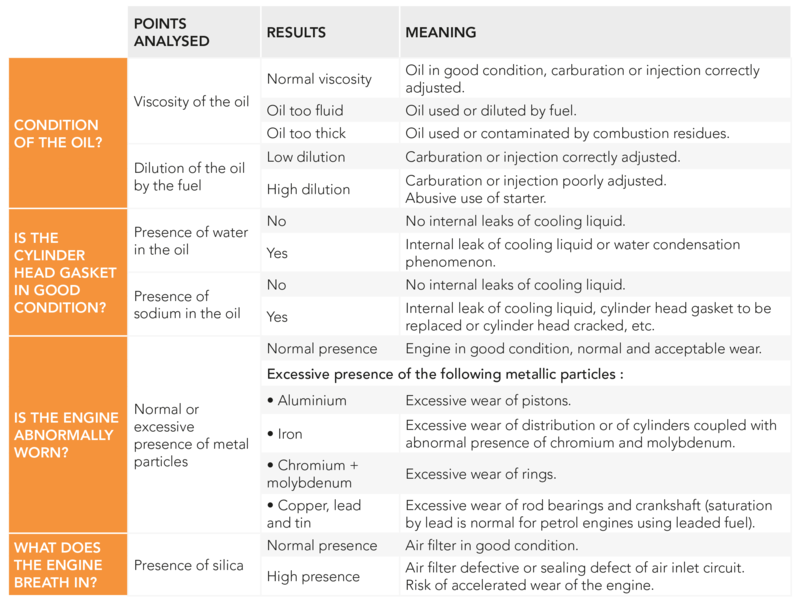 Realise your oil sampling following a normal functioning of your vehicle, fixed engine. Be careful during the operation, the oil is hot. Realise the sampling during an oil change or directly by the gauging wells. 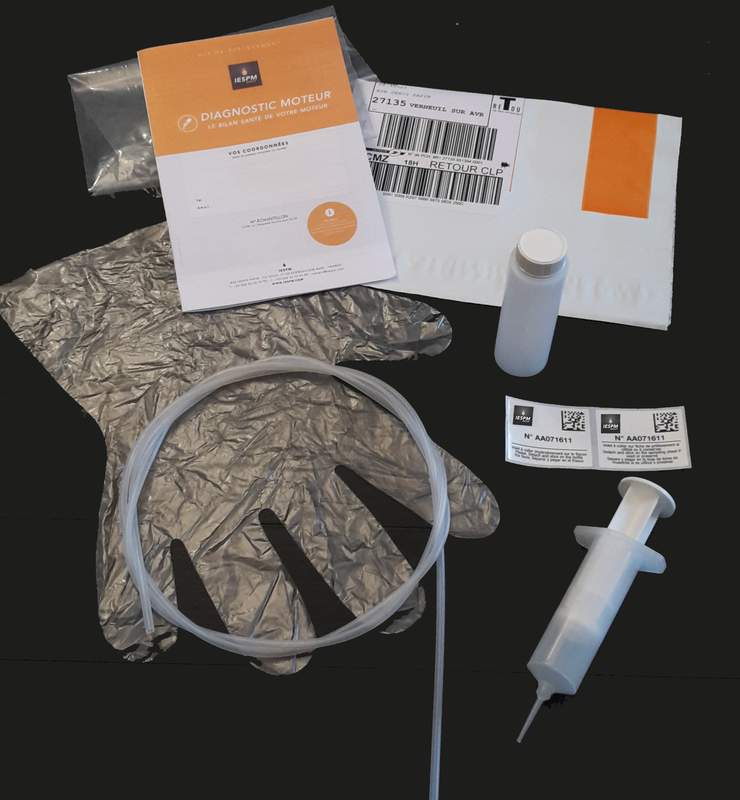 Fill the sample bottle, then fill the identification sampling form, supplied in the kit. All the information that you transmit to us is used for the analysis, the tests and the quality control. Incomplete or false information will have an incidence on the relevance of Diagnosic. All the practical indications are specified in the instructions notice of the kit. In case of doubt, do not hesitate to call your garage owner or a professional. YOUR ONLINE ENGINE DIAGNOSTIC ! USING THE ONLINE FORM !